Rebecca Aris interviews Shwen Gwee on his take on social media use within the pharma industry and what he learnt from launching a corporate Twitter account for the latest in our ‘Social pharma faces’ series. 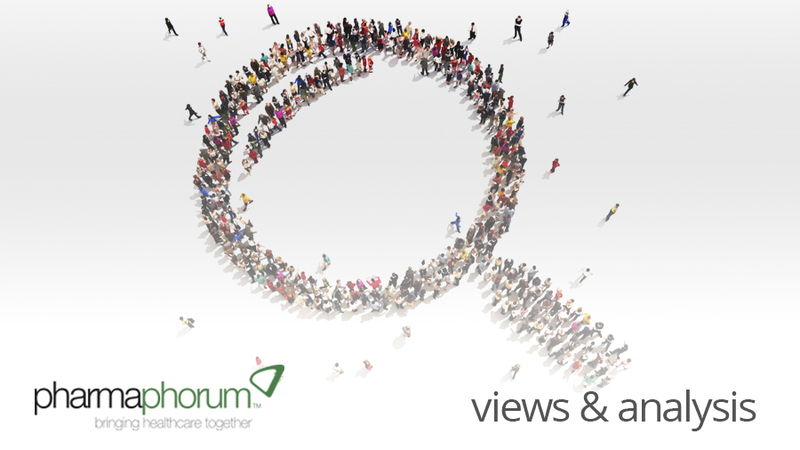 Each month we speak to an expert within the field of pharma social media on their experience in the area and their view of the landscape. This month we speak with Shwen Gwee who has shares his key learnings from launching a corporate Twitter account and his views of Twitter and social media use within the pharma space. RA: Hello Shwen, thank you for joining me. Could I just start by asking you to tell me about your background, and your current position? SG: Hi Rebecca, thank you very much, it’s an honour to be here. I’ve been at Edelman for just over a year now and I am currently VP of Digital Health at Edelman, which really means that I focus on digital strategy and social media, mainly working with pharma clients, but also the extended healthcare industry in general. Before this I was at Vertex Pharmaceuticals, where I led digital strategy and social media within the marketing team. And prior to Vertex, I was at Sepracor (now known as Sunovion), where I ran speakers bureau and other HCP engagements (e.g. advisory boards) for the respiratory franchise, but was also very involved in the digital marketing side. RA: I’d like to start by asking you something I’ve asked many others, what is your definition of social media? SG: I think social media is a very general term that often gets misused and misinterpreted. It is most often associated with a set of platforms and services that people use to communicate and publish content online, such as Twitter and Facebook and so on. However, there is also a component of social media that is less well understood, which is the culture and mindset of social media, and really understanding different ways to approach engagement on the different platforms prior to actually entering them. So, in brief, it’s two parts: it’s partly the tools that facilitate and empower anyone to actually be able to publish media on their own, and it’s also the understanding of a cultural system that goes on within those platforms. RA: Can you tell me what your key learnings were from launching a corporate Twitter account? SG: The biggest learning from launching a corporate Twitter account is that it takes far longer than you imagine to actually launch something that looks very simple. The real key to launching it was really including and educating the internal stakeholder early, and also finding senior management champion that backed me up in what I was doing. The other important thing was setting up the guardrails and the policies and guidelines ahead of time, so that there isn’t as much confusion when it launches as to how to respond and what things you can or cannot do, as well as where or when you’re willing to engage and where you can’t. It also helps to try it internally or within a smaller, more controlled setting, like a small experiment for a few weeks, then reassess where you want to go with it. These kinds of things help people get more comfortable, especially in organisations that have never done any social media before. It’s good to just dip your toe in the water and try it out first, and if it’s not for you, it should also be an option NOT to go down the path (at least at that point in time). One additional thing worth mentioning is the need to plan for resources. Twitter does not live on its own, breathe on its own, you have to be able to dedicate a resource to manage that. Again, that goes along with the guidelines and processes that you need to put in place first. The assigned person then knows how to respond, how to channel different questions, and how often they need to be active on Twitter, which really takes a lot of the work (and risk) away from just figuring it out on a day to day basis. RA: A lot of companies don’t see the value of using Twitter, and struggle to justify the time invested when return on time is immeasurable, so what do you see as the key advantages to being involved in Twitter? SG: Well I’ve often positioned Twitter as your connector in the “Tipping Point” world of marketing (a Malcom Gladwell book reference), where Twitter is the source that allows you to engage very quickly and very often with a broad audience, and then directs them to the places where you want them to pay attention to. It also gives them very quick bites of information that is easily digestible. But it really boils down to what are your key objectives, what you want to do with that particular platform, and what is the value you are bringing to that audience, Twitter included. You have to also set up measurements and metrics to make sure that you’re measuring against the objectives that you’re trying to achieve. If you’re using Twitter for disease awareness, for example, then you need to measure against that, and also understand which part of the patient journey this Twitter account plays. For corporate Twitter accounts, you need to understand who your audience is and make sure that your tweets are going to be beneficial to them. That will then allow you to drive more traffic to other places that are of interest to this audience and ensures that the tweets are actually going to be a way to amplify other news that you’re publishing. RA: What can pharma companies do to increase their Twitter followers, and what impact do you think this has? SG: Having lots of followers but not doing anything with them is the equivalent of collecting a lot of names in a database, and then not actually contacting them until some point late in the future where people have forgotten why they actually signed up (something pharma has done in the past). It’s important for pharma to understand that having a large base of followers isn’t everything. It really is understanding who your followers are, how to engage with them, and then actually trying, within guidelines, to engage with them in a meaningful way by creating value, by sharing the news they want and by pointing them to the right places for the resources they need. There is no real secret to trying to increase the number of Twitter followers you have – act in a way that brings value to your Twitter followers and engage with them. That will naturally allow your Twitter follower account to grow (organically). RA: Pharma companies on Twitter differ in their policies on following others and engaging, how do you think this affects how they’re perceived? SG: It’s interesting to look at those that are engaging with followers in a meaningful way versus those that are just pushing news releases for example. Studies, including those by Whydotpharma, (led by CEO Silja Chouquet) have shown that the more a company actually engages the more it grows and is better perceived by an audience. So it really does make a difference as to how people perceive a company. RA: Where do you think social media sits in the whole marketing mix of other media? SG: Too often social media is thought of – either by individuals or groups – as a silo’ed strategy that exists on its own, that it supplements everything else, but is not integrated with the rest of the marketing mix. Here at Edelman we actually have a model that we use that’s called “Transmedia Storytelling”, and we believe that social media is just one component of the entire marketing mix that drives online visibility, and online visibility is really the key to any endeavour that marketing or communications is trying to achieve. 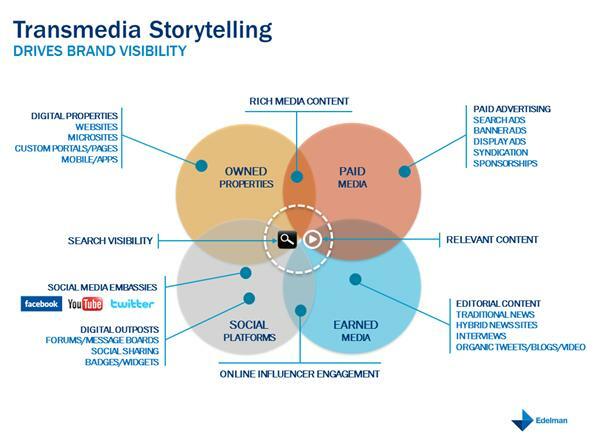 The other parts of this Transmedia Storytelling model include “Owned Media”, “Paid Media”, and “Earned Media”, and each of these pieces don’t live exclusively of each other. You can start with Owned Media that gets pushed out to the rest or you can start with social media, which then gets picked up by others. But the important thing is that the more you can drive an overlap of these various media components for your marketing or communication efforts, the more you will increase your online visibility. Of course, it is also vitally important that relevant content is at the heart of all these types of media to drive audiences to the right places and retain them on your media properties. RA: What examples of social media used by pharma do you think are the most innovative right now? SG: A very recent example is a Roche Accu-Chek sponsored curated Twitter feed called Diabetes Nest (www.diabetesnest.com). They sponsored a group of diabetes online influencers, who play curators or moderators within that aggregated site. Their tweets are pulled through as a single feed, and they become KOLs in a single online destination curating and discussing different areas on the topic of diabetes. That’s actually a very interesting case study that hasn’t been explored (by pharma) until now. The other really innovative piece that I’ve seen recently is not directly associated with social media as a platform, but more with the culture around social media, and that is: Sanofi Aventis’ Data Design Diabetes challenge, which is now in its second year. They created a platform for the public to be the ones creating solutions for diabetes by offering up a prize for a challenge to solve some of these issues. It’s similar to how the X Prize was created to drive innovation by having the public be the solution providers rather than the organisation coming up with the solution. RA: Shwen thank you very much for your time and your insights today. SG: Thank you Rebecca, I really appreciate the opportunity and to share my views and opinions with you. Shwen is currently VP of Digital Health at Edelman’s NYC office, where he is responsible for leading and developing the digital health offerings and expertise, with a focus on digital strategy and social media for pharma and healthcare. Shwen’s experience was forged on the “client-side” of pharmaceutical marketing, where he most recently led Digital Strategy and Social Media for Vertex Pharmaceuticals and launched a corporate Twitter channel, an award winning disease education website, as well as an accompany YouTube Channel, and Slideshare Channel. During his pharma tenure, he contributed to the launch of over three Rx brands. Shwen is also heavily involved in healthcare and social media (#hcsm) . He founded Social Health (SXSH) – an unconference and movement – which led to the adoption of a health track at South by Southwest (SXSW) and the Social Health Startup Bootcamp @ SXSW 2012. He also founded PharmaFresh.TV, Social Pharmer Network, Med 2.0 Blog, and is a prolific Twitterer. Shwen speaks regularly at various industry events, sits on a variety of advisory boards, and provides strategic counsel to various organizations. He has co/chaired the Digital Pharma East conference since 2009 and currently sits on the advisory board for American Liver Foundation, BlogHer HealthMinder Day, Social Media Week NYC (Health Hub), Digital Health Coalition, Medical, Marketing and Media, and the SXSW Health Track. What examples of social media use by pharma do you think are the most innovative right now?